Are The Eagles Ready To Move Up And Get Robert Griffin III? The Eagles did their due diligence and met with the probable number two pick in the draft, Heisman Trophy winner and Baylor quarterback Robert Griffin III on Thursday in Indianapolis. There’s very little chance that Griffin will be around when the Eagles pick, but you never know for sure, so they met with him. Griffin will show off his lightning speed this weekend but he won’t be throwing at the NFL Combine in Indianapolis and neither will be the probable number one pick Stanford quarterback Andrew Luck. For the Eagles to draft Griffin they would need put together a deal with the Rams and move up to second spot and draft Griffin. That’s not likely because Andy Reid is under pressure to win big in 2012. 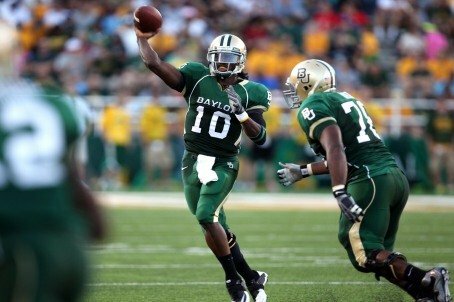 He doesn’t have the time to develop a young gifted signal caller like this young man from Baylor. The other problem with moving up would be the talented players and draft picks the Rams would want for giving up the pick. In all likelihood, the Birds would give up DeSean Jackson, Jeremy Maclin and the 15th pick in the draft to the Rams, who have no receivers for quarterback Sam Bradford. Reid would go into the season without his two top receivers, which would put him in a position to lose his job. You know that Griffin is attractive to Reid because he’s like a younger version of Vick, who is taller and more developed with a better grasp of the pro game at this time in his career. He’s shown the ability to run an offense from the pocket, which is very important in the NFL game. I don’t think there’s very much chance of the Birds moving up to get Griffin. If this were a couple of years ago, I wouldn’t say that, but the Birds have attached themselves to Michael Vick for the 2012 season and they will sink or swim with him for now. Eagles listening to offers for DeSean? Hey if you can get a talent like that go for it. so why post it then? if they arent going to get him then why even write about it? lol Please keep telling thrm how the eagles need a players to intimidate people like Burfict. we dont need a guy who tackles people 4 yards down the field, we need someone to blow up plays for a 4 yard lose. that kid from BC doesnt look like that type, he doesnt intimidadte anybody and the GIANTS will punish this kid, when i can see Burfict bust open that line and scare the crap out of QBS. dont go for the clean cut guy all the time.. we need a beast to match this defense. Where does the preposterous give of the Bird’s 15th pick, DeSean, and Maclin come from? I appreciate the fun trade speculation but let’s be serious, that would be a non-starter ask by the Rams regardless of which crazed lunatic is making player personnel decisions. Okay, I got sucked in by the obsurdity of this article. Asking for or giving up 2 starting receivers ain’t gonna happen. If the Rams are looking for a receiver they can certainly get one in free agency. If they’re all signed, DeSean Jackson, #15, and a 3rd would be reasonable. I’d be okay with Maclin, Moss, and Burress. Sign a free agent linebacker and maybe you are lucky enough to get Burfict and another safety in the second round. If you could get rg3 and burfict the first two rounds that is already a great draft. Burfict is a beast, we just have to keep him in check but I am tired of the choir boys on d.
Paulman….for once your idea makes a bit of sense. I think its a fair offer to STL….however….deal is only contingent on the trading of Vick. There’s no way Eagles’ paying for Vick and #2QB overall $$ at the same time. So Vick would have to be traded….and while I like this prospect (a lot) I am not sure there’d be as many teams knocking down Eagles’ door for him (Last year yes – this year not so much)….you really think a new coaching staff in Mia wants to build with him…doubtful….so Seattle? Cleveland? (because in this scenario they lose out on RG) These are both teams that have multiple needs…I don;t think they be willing to part with 2 hight draft picks for a 32 yr old broken down QB. They would give up both of their starting WRs? These seems really stupid to me. If Eagles were to pull of my proposed Deal with the Rams, then it would make more sense to have RGIII back-up Vick for his 1st Season, with the hopes that Vick rebounds with a strong 2012 leading the Eagles to the Playoffs then Trade Vick next off-season him to recoup High Draft picks for 2013. Djax, Asante, #15 and one of the Eagles 2nd & 4th round picks (they have 2 in each round) for #2 is the latest rumored scenario…. RGIII would sit behind Vick for 2012 then become the franchise QB for the next 10 years starting in 2013. That would be great Deal for the Rams getting 3 High Draft Picks and their WR and CB positions upgraded and a great deal for the Eagles for their future QB.. The ace up the Eagles Sleeve is what they would be able to get for VIck next off-Season.. If you get a 1st Rounder and a 3rd Rounder in return come in 2013 for VIck then basically are getting your Future Franchise QB for the next 10 Years for D-Jax and Samuel and a 4th Pick which isn’t bad at all especially when you moving Samuel regardless this off-season.. I would pull the trigger on this deal though it’s a lot up front to give up.. .. I dont know what was worse, me wasting time reading this post or GCobb wasting time writing this post! I do believe that the Eagles are going to be big movers in this years draft though. With the #15 pick, 2- 2nd rd, 3rd, 2 – 4th’s a 5th and 3 – 6th rd picks to go along with them shopping Desean and Asante. They should have many options available to them. I don’t see the using all these picks. They should be aggressive and go get players that can help immediately. My prediction on their 1st 3 picks… DT, CB & WR. Fletcher Cox, Trumain Johnson & Stephen Hill would be a nice trio. 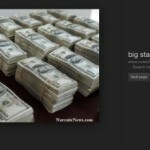 The Redskins are preparing to offer alot to get RG3.. The Washington Redskins are prepared to offer the St Louis Rams their #1, #2 and #3 picks this year along with another #1 in 2013 to move up for RG3..
That is what you call, insane.. They are trading the whole house for the guy, theyre future and all.. I do not want the eagles to do anything foolish like that..This is why the redskins continue to stink year in and out..
Could the eagles be offering Michael Vick in the trade for RG3? We didnt really consider this possibility but as mentioned Vick is 32 yrs old and is injury prone.. now i dont want to see him go but if we can get a younger Vick as birdo mentioned, then why would we pass that up? And.. if the give up vick then desean wont be included in the deal and i doubt asante either.. they wouldnt have to trade the house for RG3 if there giving up Vick in it.. I was also thinking and this is a side note, the colts could trade peyton for a top 5 pick this year so they could potentially walk away with two top 5 picks.. In my opinion all it would take is two first round picks one third and one fifth.. but the redskins seem to be trying to top everyone else.. and keep in mind what shannahan said to mcnabb, that if he had the opportunity to get a younger you then i would do it in a heart beat, not exactly a great thing to say to your QB, especially on that was as sensitive as Mcnabb was.. but the skins will do all they can to trade up for RG3 but if the eagles are willing to deal Vick then that would put them in the lead for him..
After watching Rg3s proday he reminds my alot of vick in his second year with the eagles.. I think reid and morningwig might have changed vick for the worse.. i think vick is trying to hard with his mechanics.. i dont think reid and marty quarterback geniuses that people think they are.. what have they done donavan was good becuase he worked hard .. kobb isnt anything special at all..aj feely never changed his motion at all.. only good thing about the eagles is now they listen to the fans more..
Rasheed – funny bro; I got a good chuckle outta that one! Every body else who supports this ridiculous article #^*k off. We’re on the cusp of greatness with the team we have now and for anyone at this point to even entertain trading our nucleus for an unproven rookie is the most ridiculous thing i heard of today and my day ain’t even started yet…^^@k off. i dont support it .. i just think vick is pressing alittle much rock..